At the age of 18 months Danielle Farrel’s parents Marjory and Daniel noticed something was wrong with their daughter. “I wasn’t reaching the usual milestones, like getting up and taking first steps,” she says. Cerebral palsy was diagnosed, heralding a lifetime of challenges, and a future filled with highs and lows. Throughout her childhood and early years she faced many obstacles, but with the support of her parents she fought for equal treatment. Today she has a doctorate and is running her own business, Your Options Understood (YOU), providing an inspiration for others with disabilities. YOU promotes self-directed support, encouraging disabled people to make their own decisions in matters of care, budgeting and general life choices. Seeing their daughter set up her own business seemed an unlikely outcome when Marjory and Daniel were advised against putting her into mainstream education. They insisted she was offered the same opportunities afforded to other children – and it paid off. However, another challenge arose when there was no disabled access at the Ayrshire secondary school she and her parents had chosen, and her parents placed her in Ashcraig near Stepps in Glasgow. “In a way my experience at Ashcraig set me up for the future and prepared me for a lot of challenges. Without Ashcraig I don’t think I could have achieved everything I have done,” says Danielle. A year after she lost her mum she enrolled in an NC Media Studies course at James Watt College, now Ayrshire College, and continued to HNC and then HND, which led to her gaining a third year entry place at the University of the West of Scotland. She also spent some time as a research assistant after her first degree. A Masters degree and a Doctorate followed. “I have always loved education and I just wanted to take it as far as I could,” she says. Recently she gave a talk to In Control Scotland who were hosting delegates from Finland. Part of her presentation focused on her own story of growing up with CP. “In 2015 I approached the Princes Trust who helped me set up Your Options Understood. Walter Smith, (not to be confused with the former Rangers football club manager), the chairman of the trust in Ayrshire, was very supportive as my proposal was new to them. They are used to working with more mainstream projects like shops and traditional small businesses. Her advice is now sought by wider groups and she has recently received additional funding from Tesco’s Bags of Help. “This allows me to provide training to in-school staff in support needs,” she says, adding that she does not profess to have all the answers, though she does fight for her rights. “In no way do I claim to know everything there is to know about living with a disability as everyone’s experience is different. This was apparent when in the middle of setting up YOU she had to seek rehousing. Throughout that period she had been actively engaged in mentoring and recruiting support staff. “When the decision was made to close it the social workers said I should go back and live with my dad. As much as I love my dad I didn’t want to stay with him. He was getting elderly and has his own health issues. At this stage of her life she says she encountered ignorance and discrimination. 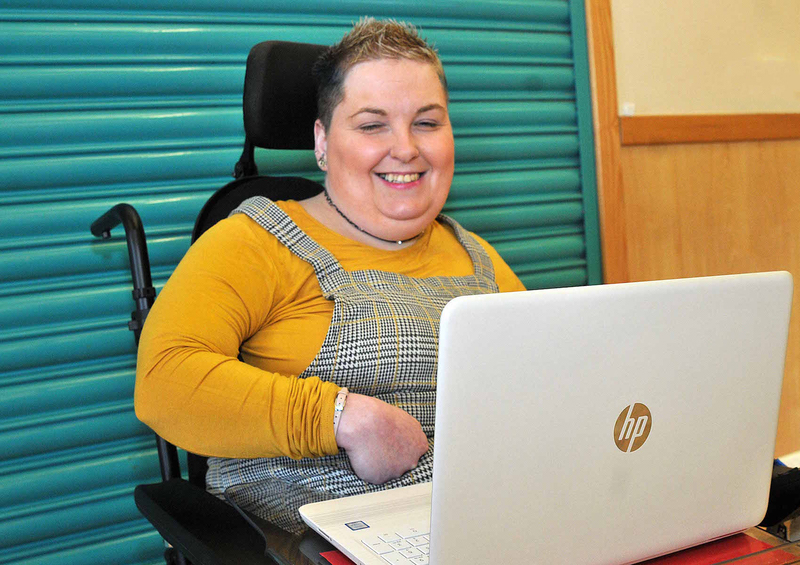 She says that she learns to live with the regular knock backs and is determined to show others living with disability that they can still be achievers. “I give talks. I spoke at Learning Together to a Finnish delegation. I also go into schools and help young disabled people manage the transition into further education. I’ve just helped one girl gain a college place.